The best thing about getting your hair done is that the possibilities are practically endless. It’s not unusual to keep your eye on the trendy cut and color options, but there’s more to a pastel hair color than meets the eye. We love staying on top of the latest trends in all things hair, but before you decide to revamp your style with a trendy new hair color, make sure you know EXACTLY what you’re getting into. Almost every A-List celeb has taken on the bleached out look at some point in the past few years. It’s a clean, sleek look that instantly brings a sense of style to any look. But proceed with caution, because a bleach out can lead to hefty damage on your ends. Deep conditioning treatments on a bi-weekly or monthly basis will be important when keeping your cut look fresh, as well as staying away from hot tools (blow dryer, curling wand, straightener, etc.) as much as possible. 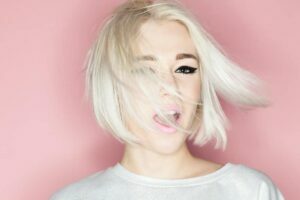 Whether you’re looking to go silver-blonde, gray, pastel or just straight blonde bombshell, you will need to go through an extensive bleaching process that will take multiple appointments. 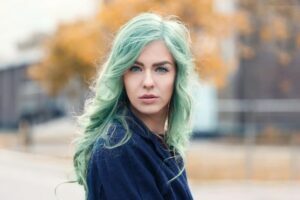 Mint green can be a vibrant and summery change when you’re fresh out of the salon, but it only takes one or two washes until it fades to a yellow-esque hue. Unless you are prepared to get a bi-weekly toner, this color may not be for you. Othe pastels, such as rose gold, pink and lavender also have a tendency to fade out fast. If you are going to pursue this look, invest in a color-depositing shampoo to maintain (or at least slow down) the fading of your hair. Are you ready to take on a trendy color? This process can take up to 6 months, so be prepared to go through a transitional period. Schedule an appointment today to get your journey to being blonde started! ← Should I Cut My Hair For The Summer?